In the list of reasons why people run, weight loss comes near the top. Running is obviously a very effective way to reduce and control weight. Indeed, many runners who started when overweight have long since left behind any concerns they had about their weight. Consciously focusing on weight loss means being focused on being overweight, which in turn negatively affects self esteem. Thoughts about being overweight are coupled with negative self-image, lack of confidence in actually doing something about it, and many other feelings that block the motivation to change. This is why having weight loss as a goal isn’t a very effective way to lose weight. So, how do you address the behaviours that cause weight gain without thinking too much about being overweight. You need a bypass, a short-cut to the triggers that can facilitate the life changes that are necessary for effective weight management. Hypnosis can provide that short cut. It tackles the problem at the very root of its existence: in the unconscious mind. But not all hypnosis treatments or practitioners are equally effective. If you are lucky enough to find a hypnotherapist who really connects with you and and your own particular needs then great, because that can literally set you off on the road to a new you. An expertly personalised hypnosis session will utilise your own, unique personality, thoughts and experiences for great effect. But it can prove to be quite expensive though, and not everyone lives conveniently close enough to someone who is good. What about the alternative, self hypnosis? Yes, if you have the knowledge and experience to create an effective strategy. Not everyone does though. You need to understand the structure of a well-formed hypnosis script. The correct use of induction and deepening techniques and how to apply hypnotic suggestion. High quality recording facility will help immensely too, as will a professional voice artist or even better a qualified hypnotherapist. This all costs time (and money too) if you are to create something very worthwhile. There is a middle ground, between the one-to-one hypnosis session and self hypnosis. Books on hypnosis can provide some excellent help, and I’d recommend seeking out a copy of Monsters and Magical Sticks: Or, There’s No Such Thing as Hypnosis, by Steven Heller. It is a remarkable book and truly a worthwhile read for anyone interested in hypnosis. There are of course many other books on hypnosis, some good, some not so. Some will suit certain learning styles and personalities, so it’s really worth reading reviews or checking out the actual books in a good bookshop or library. As ever, learning from a book requires dedication and motivation, ironically something that hypnosis can certainly help with. So, in common with any self-help book, the vital ingredient is action; it’s all very well reading about this stuff, but if you don’t act, it’s not going to work. If you want to experience some high-quality hypnosis at a fraction of the price of consulting a hypnotherapist (with the added benefit of unlimited repeat sessions), then downloadable audios are definitely worth trying. 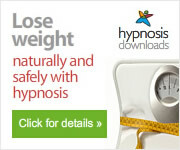 Specifically, professionally written and voiced hypnosis downloads for weight loss. I qualified as a hypnotherapist under the expert guidance of Uncommon Knowledge. The same company produce downloadable hypnosis sessions for a huge variety of conditions or goals. Each download is professionally recorded and covered by a customer satisfaction guarantee. We use their recordings for running applications and heartily recommend them. For the comparably low investment, they can offer a real short-cut to effective hypnotherapy, be it for weight loss or simply to improve your running.